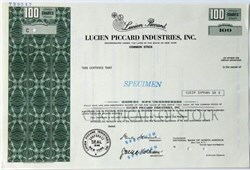 Beautifully engraved specimen stock certificate from Lucien Piccard Industries, Inc.. This historic document was printed by the Security Columbian Banknote Company and has an ornate border around it with a vignette of the company's logo. This item has the printed signatures of the Company’s President and Secretary. Lucien Piccard was founded in Switzerland in 1923. In recent years, the Hollywood, Florida-based LP Watch Group launched new brands LP Italy, LP Swiss, and DuFonte by Lucien Piccard. The LP Italy “Stratosphere” watch won the JCK 2005 award for most innovative new design. Reports indicate that the brand spent heavily on advertising and marketing during 2007-2009. In 2007, LP Watch Group became a sponsor of the American Le Mans auto racing series. The Group also sponsored the Executive Women’s Golf Association. Unfortunately the company ran out of time and filed for Chapter 11 bankruptcy protection in Florida on July 14, 2010.